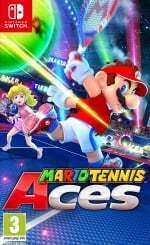 Recent Mario Tennis games have had a tendency to release characters over time and the latest entry on Switch is no different. So far, Camelot has added characters like Diddy Kong and Birdo, and soon the famous flying Koopa will join the cast of Mario Tennis Aces. In preparation for Koopa Paratroopa's arrival at the start of next month, Nintendo Japan has released a new trailer highlighting his airborne skillset. He'll float around the court in a similar fashion to Boo, whilst sporting the abilities of a technical player. The character was officially confirmed earlier this year during the September Nintendo Direct. Take a look at the brief clip above and tell us in the comments if you're still regularly enjoying a game of Mario-themed tennis on the Switch. I don't regret buying this game much, but after I beat the main story, didn't have much motivation to keep playing. I liked it as well. It did what it needed to and has been fun all around. Great game, 75 hours I've managed rack up and I haven't even bothered with the single player content. Online Simple Rules is where it's at,endless fun. I don't think I could think of a less interesting topic if I tried. 3 months later and they're trying to hype up paratroopa? The game's biggest flaw, in my opinion is that the online Tournament Mode is restricted to only the variations of the basic Marina Stadium court. Since that's kind of the main draw of the game if you don't have friends over to play local multiplayer with, it just makes the game feel somewhat shallow. You can either play on the cool, unique courts in the Free Play mode, where winning matches counts toward nothing, or limit yourself to basically the same amount of content as the post-launch demo or Ultra Smash in a mode that actually does give you gratification by letting you work to improve your rank. A lack of content isn't the games problem, it's a lack of options by which the content is distributed. All that being said, the game is still fun for playing the occasional match, and I'm always interested in coming back and trying the new monthly characters (even if they should have been put in from the beginning, since their code was found in the game before launch). I just wish the game had left more of a hook in me. I stil play the game every now and then, so for me this is an Nice addition. Nice, can't wait to get him as a playable character. Game is fun just the online match making is unfair to newbie/rookie players. Great game. Great online game. Great online tennis game. If Nintendo improves it, I'll pay for the online service. Otherwise I'll stick with the local multiplayer. I've sunk 105 hours into it, mainly the online tournament. Sadly I bought online not to play online but to monthly be able to download tennis characters. Mixed feelings about that. I never cared for alternate versions of characters already in a game, least not ones that are virtually the same with one difference. Mario Aces already has Koopa Troopa, so I don't care for one with wings. So happy to have this guy back! Excited for Koopa Paratroopa. Please add a new Co-Op Challenge with new unlockable accessories / character color schemes too! I loved the Boo event and was hoping that would continue regularly!